XSEED and PQube have both announced an “Ultimate Day One Edition” for Shantae: Half-Genie Hero. For both North America and Europe, the limited physical editions will include a 30-track “Risky Beats” soundtrack, a new art book, and three DLC: Pirate Queen’s Quest, Costume Mode, and Friends Mode. The North America version will be exclusive to the Nintendo Switch, but the European version will be available for the PlayStation 4 and Nintendo Switch. The game will be available for both North America and Europe in spring 2018. However, XSEED has previously published “Risky Beats” physical edition before for PlayStation 4 and Wii U along with a digital PlayStation Vita release. For more information, check out press releases provided by XSEED and PQube. Nintendo Switch Version of Crowdfunded Indie Fan-Favorite Dances onto Shelves in Spring 2018, Includes Bonus Modes Shantae: Pirate Queen’s Quest, Shantae: Friends to the End, Costume Mode DLC, and More! Torrance, Calif. — December 7, 2017 — XSEED Games, the independent-minded publishing brand of Marvelous USA, Inc., today announced that the hit crowdfunded action platformer developed by WayForward, Shantae: Half-Genie Hero, will receive a limited “Ultimate Day One Edition” physical release for Nintendo Switch™ in Spring 2018, priced at an MSRP of $39.99 and available at select retailers throughout North America. The Nintendo Switch exclusive “Ultimate Day One Edition” physical release includes the game’s groovy 30-song ‘Risky Beats’ soundtrack on CD, a dreamy new art book, and plenty of company for Shantae with the bundled ‘Pirate Queen’s Quest’ DLC, as well as the brand new ‘Costume Mode’ and ‘Friends Mode’ DLC. Don the fancy hat, trade magic for good old-fashioned weapons and tools, and play the role of the bodacious (and ambiguously evil) buccaneer Risky Boots with the Pirate Queen’s Quest DLC. Having successfully stolen the powerful Dynamo from Shantae’s uncle, Risky Boots must now traverse the game to uncover the five mysterious components needed to upgrade the machine and bend Sequin Land to her will in this all-new adventure! The “Ultimate Edition” also includes the new Costume Mode and Friends Mode DLC, because no dance party is complete without friends and costumes! Friends Mode takes Shantae’s pals Sky, Bolo, and Rottytops into her nightmare where they must find and save her from certain doom. This all-new storyline features ethereal new levels and a special boss encounter. Shantae’s wardrobe gets expanded, too, with the Costume Mode DLC, which provides three new arcade-style adventures for her to sashay her way through in style. Stick to the shadows as Ninja Shantae, soak in the sun as Beach Shantae, or lay down the law as the Mighty Switch Force-inspired Officer Shantae in these arresting new arcade adventures! Following three highly successful releases with Shantae, Shantae: Risky’s Revenge, and Shantae and the Pirate’s Curse, Shantae: Half-Genie Hero reacquaints players with the cast of Shantae in full HD. The magical world of Sequin Land is more vibrant than ever with high-definition graphics that retain the charm of the original 2D hand-drawn sprites the series is known for. 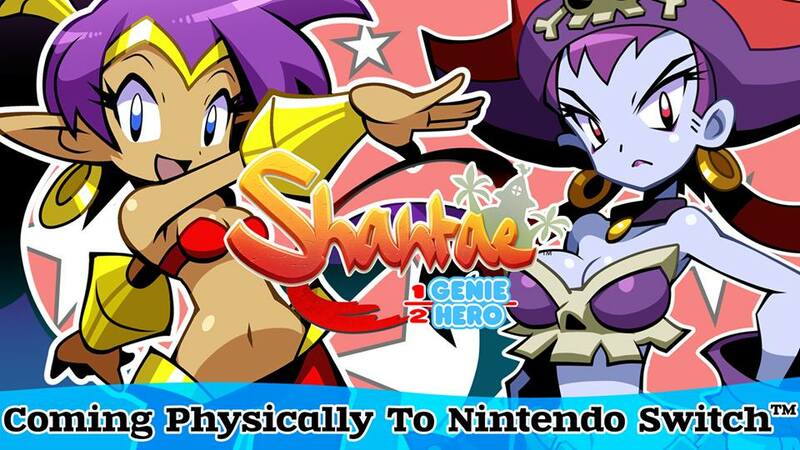 Shantae, the spirited young half-genie, must once again defend Scuttle Town from the pirate captain and self-proclaimed Queen of the Seven Seas, Risky Boots, who plots to steal a newly discovered limitless source of power. Shantae has previously protected her hometown from all forms of evil including steam-powered pirates, undead evildoers, and militaristic madmen, and is ready to take on Risky Boots with her trademark Hair Whip attack and Belly Dance moves, which give her the power to transform into eight different creatures. Non-stop action with immersive 2.5D environments and a new relic system give novice and expert players a uniquely tailored platforming experience. All of Sequin Land becomes a fully explorable world — after conquering massive bosses, the Arcade-style action stages can be revisited to discover new items and secrets based on new abilities Shantae has gained in later areas. Shantae: Half-Genie Hero is developed by WayForward for PS4™, “PS Vita”, Wii U™, and Nintendo Switch. XSEED Games has previously published the “Risky Beats” physical editions, each packaged with a musical selections CD, as well as the digital “PS Vita” release. The Shantae: Half-Genie Hero “Ultimate Day One Edition” retail release for the Nintendo Switch will come packaged with the ‘Risky Beats’ CD soundtrack and a new art book, and is scheduled for release in Spring 2018 at an MSRP of $39.99. More information on Shantae: Half-Genie Hero can be found at www.shantaehgh.com. This title has been rated “T for Teen” by the ESRB with the descriptors of Cartoon Violence and Suggestive Themes. PQube will be the publisher of the physical “Ultimate Day One Edition” in Europe, and more information can be found on their website at http://www.pqube.co.uk/. For more information on XSEED Games products, please visit www.xseedgames.com. Fans can also follow XSEED Games on Facebook, on Twitter, and on blog on Tumblr. PQube (London, UK) December 7, 2017 – PQube today announced that critically-acclaimed action platformer Shantae: Half-Genie Hero, from WayForward, is receiving a physical ‘Ultimate Day One Edition’ release across Europe for both PlayStation 4 and Nintendo Switch in Spring 2018. This collectable edition of the crowdfunded hit includes a bumper art book containing never-before-seen images from Shantae: Half-Genie Hero, the toe-tapping 30-track ‘Risky Beats’ soundtrack CD, plus three bumper game expansions in the form of the bundled ‘Pirate Queen’s Quest’ DLC, the ‘Friends To The End’ DLC and also the ‘Costume Mode’ DLC. As the defender of Scuttle Town, Shantae has previously defeated steam-powered pirates, sinister undead and even a military takeover in a bid to keep her home town safe. Now, in Shantae: Half-Genie Hero, the sassy half-genie must rise to the occasion once again as the Queen of the Seven Seas, Risky Boots, plots to steal a newly discovered limitless source of power. But that’s not all! In the Pirate Queen’s Quest, series protagonist Shantae makes way for a new hero: long-time villain Risky Boots herself! Swap magic and good intentions for weapons and an attitude as Risky Boots embarks on her own quest to take over Sequin Land: traversing the game’s levels in search of components to upgrade Shantae’s uncle’s Dynamo device and use it to rule the world. Another all-new quest awaits in the Friends To The End expansion. This time, with Shantae’s life hanging in the balance, buddies Sky, Bolo and Rottytops step forward to save the day. All three fan-favourites are playable and bring fresh (or in the case of zombified Rottytops, putrid) skills to the fore as Shantae’s besties dive into her mind and fight through the Nightmare Realm to rescue the heroine of Scuttle Town. The third and final expansion, Costume Mode, lets Shantae don a trio of new costumes. Dress up as Ninja Shantae, Beach Shantae and Officer Shantae and enjoy three new arcade-style adventures that make use of Shantae’s extra abilities. The new Shantae: Half-Genie Hero art book and the 30-song Risky Boots soundtrack CD complete the Ultimate Day One Edition collection, which will be available from all good European videogame retailers in Spring 2018. Shantae: Half-Genie Hero Ultimate Edition will dance its way on to PlayStation 4 and Nintendo Switch in Spring 2018!